If you receive an error message when trying to display your posts then you can use the table below to diagnose the issue and find the relevant solution. 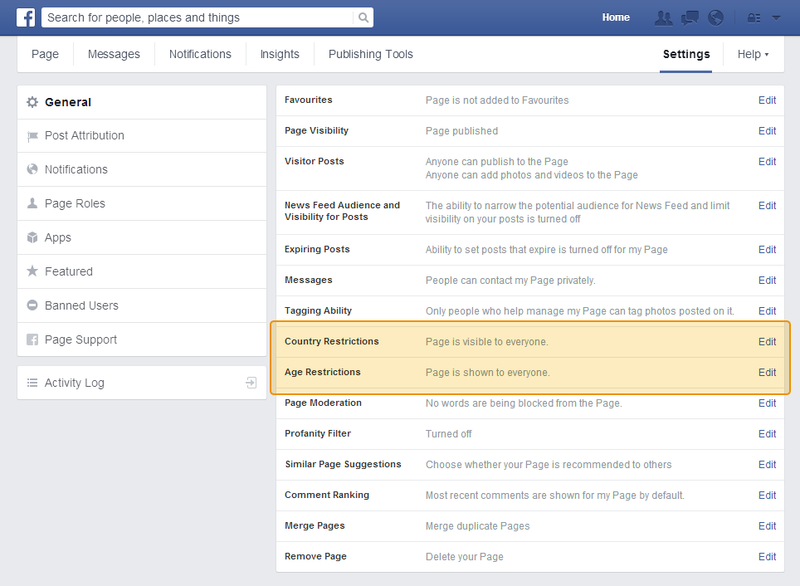 (#10) To use ‘Page Public Content Access’, your use of this endpoint must be reviewed and approved by Facebook. To submit this ‘Page Public Content Access’ feature for review please read our documentation on reviewable features. Error: Unsupported get request. Object with ID ‘1234567890’ does not exist, cannot be loaded due to missing permissions, or does not support this operation. Error validating application. Cannot get application info due to a system error. Error: Error validating Access Token. The session has been invalidated because the user changed their password of Facebook has changed the session for security reasons. Your Access Token has become invalid due to changing the password on your account. Please obtain a new Access Token. The easiest way to check whether you’re trying to display posts from a personal profile instead of a page is to view your page on Facebook and see whether you have ‘Friends’, ‘Likes’ or ‘Members’. Profiles have ‘Friends’, pages have ‘Likes’ and groups have ‘Members’. If you have ‘Friends’ then it’s not a page, it’s a personal profile. If you’re using the profile to represent a business, organization, product, public figure or something else other than yourself, then we’d advise converting your profile to a page per Facebook’s recommendation: http://www.facebook.com/help/175644189234902/, as there are many advantages to using pages over profiles. It is in fact against Facebook policies to use a profile to represent something other than yourself (see ‘Why should I convert my profile to a page’ in the link above). Once you’ve converted to a page then the plugin will be able to retrieve and display all of your posts. Some posts are filtered out by the plugin as they aren’t useful, such as ‘__ commented on their own status’, or if you are choosing to only show certain post types. If the post limit isn’t high enough then there may not be any relevant posts to display. Try increasing the post limit on the plugin’s Settings page to be 10-15 higher than the number of posts you are trying to display. The maximum post limit varies depending on how much data is associated with your posts, but it’s usually around 100. The feed you’re trying to display has to be a publicly accessible page. If your page has any restrictions on it (age or location) then it means that users are forced to sign into Facebook in order to view your page. This isn’t desirable for most pages as it means that it isn’t accessible by people who don’t have a Facebook account and that your page can’t be crawled and indexed by search engines. An easy way to determine whether your page is set to public is to make sure you’re signed out of your Facebook account and then try to visit your page. If Facebook forces you to sign in to view your page then it has a restriction on it. You can remove any restrictions by logging into your Facebook account and going to the Settings for your page. You can then remove any Country Restrictions and Age restrictions (see screenshot). Once removed this will allow the Custom Facebook Feed plugin to access and display your posts. See this FAQ for information about displaying content from Facebook groups. If your page is fairly new then it may not actually have an eligible posts that the plugin can display. Notifications such as ‘__ changed the cover photo’ or ‘__ created a page’ are filtered out and aren’t displayed. Try creating a new post on your page and then viewing the plugin’s feed again. When creating a new Facebook page it isn’t actually published publicly until you click ‘Publish’ at the top of your page. If it isn’t published then the plugin isn’t able to retrieve your posts. Check the top of your page to see whether there is a ‘Publish my page’ or similar button. Follow the directions on this page carefully to ensure that you’re using the correct Facebook ID. If you’re using your own Access Token then the easiest way to check whether it works is to test it on the Demo page. Simply check the option which says ‘Test my Access Token’ and paste it in to see whether or not it’s valid. There’s no need to set a Page ID when testing as it will just use the default Page ID which is hard coded into the demo. If you don’t see any posts then your Access Token isn’t valid. To fix this issue, simply update the plugin to the latest version (you can find the latest version numbers in the change logs here: Pro, Free) and click the blue Facebook button labeled “Log in and get my Access Token” on the plugin’s settings page. This will then provide you with your own Access Token. If you’re having an issue updating the plugin then please see this FAQ. In order to retrieve your posts from Facebook the plugin requires a few basic PHP modules which are enabled on the majority of web servers by default. If these are disabled on your web server then it may be the cause of the problem. You can check this by going to the plugin’s Settings page, clicking on the Support tab and then scrolling down to your System Info section. 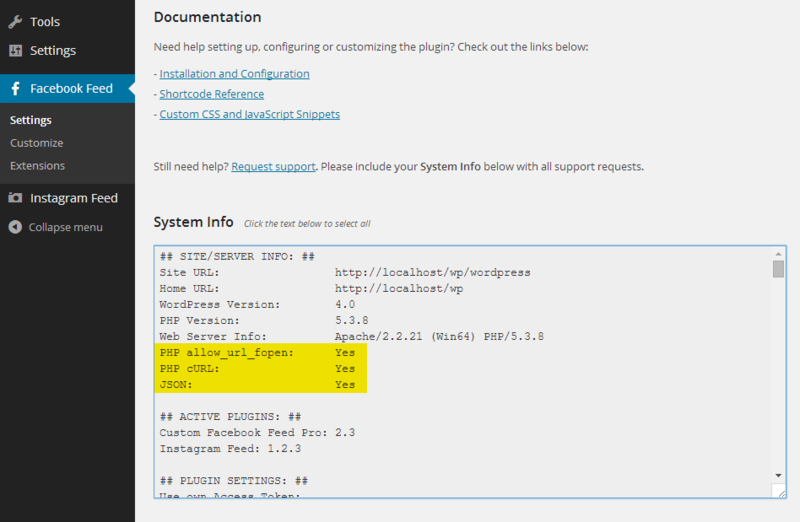 In the section labeled ## SITE/SERVER INFO: ## you should see the three items highlighted below. If JSON is marked as No, then this means that JSON isn’t running on your website server. You should contact your web host to request that they turn this on as it is required in order to use this plugin and many others. If both PHP allow_url_fopen and PHP cURL are marked as No then it means that both of these PHP extensions are disabled in your server’s php.ini file. If you are familiar with editing this file then you can enable one or both of them yourself, otherwise it’s recommended that you contact your web host and request that they enable one or both of these extensions on your server. 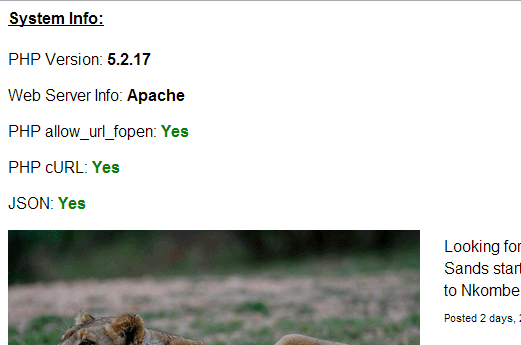 If only one of either PHP allow_url_fopen or PHP cURL is marked as No then the plugin should still function as expected. If you’ve gone through the troubleshooting steps above and your Facebook Page ID works in the demo then there may be an issue with your site connecting to the Facebook API. This is usually caused by a security setting on your website’s server and can be remedied by your hosting support team. Please see this FAQ for more information and steps on how to solve this. If you request too much data from Facebook’s API then it will occasionally send back an ‘unknown error’ message. Facebook has certain limitations on it’s API and doesn’t allow you to retrieve too much data in one request and put too much load on their servers. If you’re requesting a high number of posts or have the post limit set very high then try reducing the post limit. You can do this via the ‘Change the Post Limit’ setting on the plugin’s Settings page. Facebook’s API may be unreachable temporarily. Try waiting a few minutes and then trying again. You can clear the plugin cache and force the plugin to check the Facebook API again by clicking the ‘Save Changes’ button on the plugin’s Settings page. To fix this, simply update the plugin to the latest version (you can find the latest version numbers in the change logs here: Pro, Free) and click the blue Facebook button labeled “Log in and get my Access Token” on the plugin’s settings page. This will then provide you with your own Access Token. If you’re having an issue updating the plugin then please see this FAQ. This error message means that your web server’s IP address has been blacklisted by Facebook, most likely because someone else using the same IP address has violated the Facebook Terms of Service. If you’re on a budget web hosting plan then you most likely share your web server with hundreds, if not thousands, of other websites. As you all share the same IP address then if one of those website’s has the IP address blacklisted/blocked by Facebook then all of the websites on the server are also blocked. The only way around this is to contact your web hosting company and ask them to either change your IP address or move you to a different web server. The Access Token you are using has expired. To fix this issue, simply update the plugin to the latest version (you can find the latest version numbers in the change logs here: Pro, Free) and click the blue Facebook button labeled “Log in and get my Access Token” on the plugin’s settings page. This will then provide you with your own Access Token. If you’re having an issue updating the plugin then please see this FAQ. If you are using a token from your own Facebook app, then make sure you extended the token by following the directions in steps 16 and 17 of the Page Access Token directions. It’s important to copy the token from step 16 into the field in step 17 and click the “Extend my token” button. The Facebook API doesn’t like it when too much data is requested in one go. If you have the number of posts or post limit setting set too high then it may be causing a Facebook API error and returning no posts. If the number of posts or your post limit is 100 or more, try reducing it to see whether posts then appear. Please note, that if you’re adjusting the ‘limit’ setting directly in the shortcode then you may need to click ‘Save Changes’ on the plugin’s Settings page in order to clear the plugin cache and check Facebook for new posts. Due to server configuration or security settings it’s possible that the request method that the plugin uses to retrieve your posts is failing either permanently or sporadically. If this is the case then usually the plugin will fall back to using an alternative method, but on some rare occasions this isn’t the case. You can try manually changing the request method used in the plugin to see whether this fixes the problem. To do this use the setting in the following location: Facebook Feed > Customize > Misc > Misc Settings > Request Method. After changing the method you may need to click ‘Save Changes & Clear Cache‘ on the plugin’s main Settings page (where you set your Facebook ID) which then forces the plugin cache to clear. It is unfortunately no longer possible to display content from a Facebook Group. Please see here for more information. Facebook deprecated version 2.0 of their API on August 8th, 2016, which affected certain parts of the plugin. To fix this, simply update the plugin to version 2.6.8 or higher. If you’re having trouble updating the plugin then please refer to this FAQ. You can also update the plugin manually by following these directions. 2) You’re using an incorrect Page ID. Please see this page for directions on how to obtain your Facebook Page ID. On April 24th, 2018, Facebook made a change to their platform where any developer app which is still in “Development mode” will no longer be able to retrieve public data from their API. To fix this issue, simply update the plugin to the latest version (you can find the latest version numbers in the change logs here: Pro, Free) and click the blue Facebook button labeled “Log in and get my Access Token” on the plugin’s settings page. This will then provide you with your own Access Token. If you’re having an issue updating the plugin then please see this FAQ. Due to some sudden Facebook changes “App” Access Tokens from new Facebook apps are temporarily unable to access the Facebook API. To fix this issue, simply update the plugin to the latest version (you can find the latest version numbers in the change logs here: Pro, Free) and click the blue Facebook button labeled “Log in and get my Access Token” on the plugin’s settings page. This will then provide you with your own Access Token. If you’re having an issue updating the plugin then please see this FAQ. You’re unable to use this Access Token in the plugin. To fix this issue, first update the plugin to Pro v3.6+ or Free v2.8+ and then click the blue Facebook button labeled “Log in and get my Access Token” on the plugin’s settings page. This will then provide you with your own Access Token. If you’re having an issue updating the plugin then please see this FAQ. Facebook recently made a platform change which caused an issue with our plugin connecting to their API. To fix this issue, first update the plugin to Pro v3.6+ or Free v2.8+ and then click the blue Facebook button labeled “Log in and get my Access Token” on the plugin’s settings page. This will then provide you with your own Access Token. If you’re having an issue updating the plugin then please see this FAQ. This error means that there’s an issue with the Facebook account you’re using to try to log in via our plugin. This typically happens due to Facebook flagging your account for suspicious behaving or violations of their terms. This error isn’t related in any way to our products, but is an issue with your Facebook account itself and so needs to be resolved with Facebook beofre you can use your account to log in via our plugin. Often, this issue occurs when your Facebook user account has failed a security checkpoint and you will need to log in at https://www.facebook.com or https://m.facebook.com to correct the issue. 1) Your username does not appear to be your real name. See this link for more information. There are other reasons your Facebook account might have this issue, but these are the most common ones. 1) Delete the browser history and cookies for your browser. 2) Log into https://www.facebook.com or https://m.facebook.com from that browser (if the issue is related to pages or ads, you may need to log into the Business Manager instead). 3) This should load a new page with a security checkpoint that lists the actions you need to take to address the root cause that blocked the account in the first place (verifying your ID, removing inappropriate content, etc..). 4) If the checkpoint does not appear, or renders as blank (a common problem reported), see this guide on the Facebook forums for a possible workaround. 5) Once you have completed the necessary steps given by the checkpoint (or followed any steps provided by Facebook support) then your account will then be unblocked and you should be able to use your account as normal to authorize our plugin. If the above steps don’t work, then you would need to contact Facebook support as we are unable to assist with issues with Facebook accounts themselves. This error occurs when the Access Token you’re using is making too many requests to Facebook in a short period of time. If you are using the same Access Token to display a lot of different Facebook feeds – either on your own website or across multiple sites – then you may exceed the API request limit that Facebook has set for your Access Token. This is usually simple to fix by just changing the caching settings in the plugin. For example, if you have the setting labeled “Check for new posts every” set to be a short period of time (less than 15 minutes) then the plugin will be making more requests per hour than if it’s set to be 1 hour, especially if you’re using this same setting for multiple feeds. How many requests can I make with the same token? This varies based on the Facebook page that the Access Token is from. Facebook grants an API request limit to an Access Token based on how many engaged users the Facebook page that the Access Token is from has. An “engaged user” is any user who has clicked on your Facebook Page or it’s content within a 24 hour period. For every engaged user your Access Token is granted a request limit of 4,800 per rolling 24 hour period. For more information on Facebook API Request Rate Limits please see here. 1) How active your Facebook page is. If it isn’t very active then it’s likely you haven’t had many engaged users in the past 24 hours and so your Rate Limit will be low. In order to increase your API Rate Limit, if only temporarily, you could post on your Facebook to encourage engagement from your users in the form of clicks, likes, shares, or comments. 2) How many feeds are using this Access Token. If you have 5 feeds using it then it’ll make a lot less requests than 100 feeds. If you are an admin of other Facebook pages too then you could try “spreading the load” over multiple tokens. Due to a recent Facebook bug some users have reported an issue with photo or video feeds not displaying. To resolve this issue please obtain a new Access Token by using the “Log in and get my Access Token” button on the plugin’s Settings page. If that doesn’t fix the issue, then you may need to reauthorize our plugin app. To do this, please follow the directions here. If you’re still having trouble displaying your posts after trying the common issues above then please contact support for assistance.